The London-wide strike on the 28th March saw school teachers and lecturers from further and higher education strike in defence of our pensions. 8,000 marched through the streets of London to rally outside Gove’s HQ. The day was a great success. The strike was important for three reasons. First, it showed the government that the fight to defend our pensions is far from over. It showed that we were still united and as determined as ever to stop them making us pay more, get less and work longer. Second, this was the first strike and mass protest since the Tory led coalition budget. One of the most class ridden budgets for 30 years which cut the tax of the very rich whilst robbing pensioners, and those on benefits to help pay for wealthiest in the country’s hand out. The third reason why the action on M28 was important was because it sent a clear message to those in the leadership of our movement that we want them to step up the action and not to manage its decline. There is a great deal of anger across all the unions that took action on N30 that the leaders of the biggest unions agreed to sign up to the government’s Heads of Agreement (HoA). Members of NUT and PCS as well as UCU were also angry that although M28 was successful, the strike should have been a national one. The NUT meet over Easter where there will be a lively debate over the next steps. A part of that debate will be about putting national action back on the agenda. Mark Serwotka , GS of PCS, at the London rally called for further national action . Other unions are also speaking about taking more action over pensions. For example UNITE Health are balloting their members on HoA and the result will be out soon after Easter. The UCU exec met on Friday and passed a motion calling on further rolling /regional and national action alongside other unions. There will be a meeting of all the ‘rejectionist’ unions , which includes UCU, to meet up to discuss coordinating further national and rolling strike action immediately after the NUT conference. 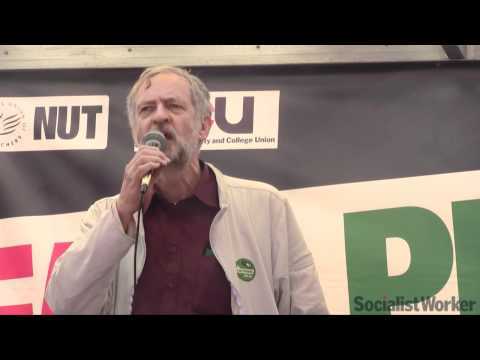 The London strike was made successful by the amount of solidarity that colleges and universities received in London. UCU Left members in London Region of UCU set up a twining operation whereby branches twined with colleges in London. They were taken back by the fantastic response from branches across the country. All colleges and universities in London were twined with at least one branch. Messages of support were sent as well as money collected. 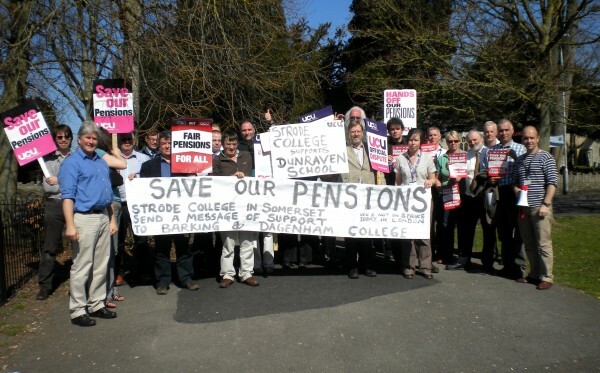 Some branches organised lunchtime protests and sent a photo of it with members holding their home made banners with a personalised message to the college that they were twinned with. We need to build on the success of M28 both in terms of keeping up the pressure for more action as soon as possible and developing the links between branches that proved to be so effective in making M28 successful.